My days of going to see the same tour multiple dates are pretty much over. 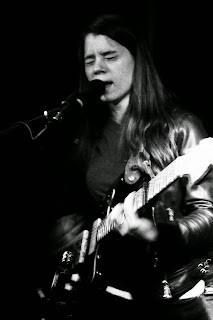 I just saw Lady Lamb at one of her album release parties back in March, so normally I wouldn't feel the need to see her two months later. But this is Lady Lamb we're talking about, and the Press Room holds 85 people. The last venue I saw her in, The Sinclair, holds 525 and she sold that out easily. There won't be many more chances to see her in such an intimate venue, so I had to make the trip up to Portsmouth to see her again. The Press Room has a very odd set up. Shows here take place upstairs from the restaurant, but the upstairs still has tables with people eating. If you get there before the show starts, you either sit at the bar or mill about awkwardly between tables where people are eating while you are constantly in the way of the waitstaff. But the venue is extremely intimate. There really isn't a typical stage. There is a small ledge at the very back of the room where the drum kit sat, but the rest of the band stood on the floor at the same level with the audience, with only monitors and amps designating where the performance area ended and the audience began. In fact, Aly Spaltro apologized to the portion of the crowd that wasn't right up front if they wanted to see her, as she's not exactly the tallest of performers. 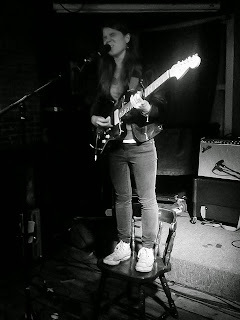 To rectify this, she stood on a chair during her solo songs ("Sunday Shoes," "Between Two Trees," and show closer "Ten). It was a remarkable show, with her three piece band sounding remarkably tight. Six weeks of playing together virtually every day will do that. Spaltro's voice did sound a little ragged and tired. She did cancel a couple shows due to illness earlier in the tour, which could have been the culprit. Aside from cutting out a few times, the tour exhaustion didn't affect her voice at all, and it retained the same power she displayed back in March. It was also the first time I saw her without her banjo, but I understand not wanting to lug an instrument from coast to coast for one, maybe two songs per night. "Crane Your Neck" has become quite the set closer (She did play "Ten" immediately afterwards, but it was almost an encore. She would have had to push through the crowd and then push back in order to play a true encore), and I doubt anyone at the show would have had it any different. Opener Rathborne went to high school with Lady Lamb, which could have gone horribly wrong. Choosing a high school friend to go on tour isn't always an artistic choice, but Rathborne fit perfectly. He was playing with a drummer he hadn't met until the tour started, but six weeks of touring made them tight. As it was a male/female rock duo, it invites comparisons to The White Stripes and Shovels & Rope, so here goes: If The White Stripes are the noisy indie rock version of the blues and Shovels & Rope are the noisy indie rock version of country and rockabilly, Rathborne is the noisy indie rock version of 60s pop. Great stuff, and I look forward to coming across him again someday.